Rosettes are special crisp, tender pastries that are traditional in Scandinavia. 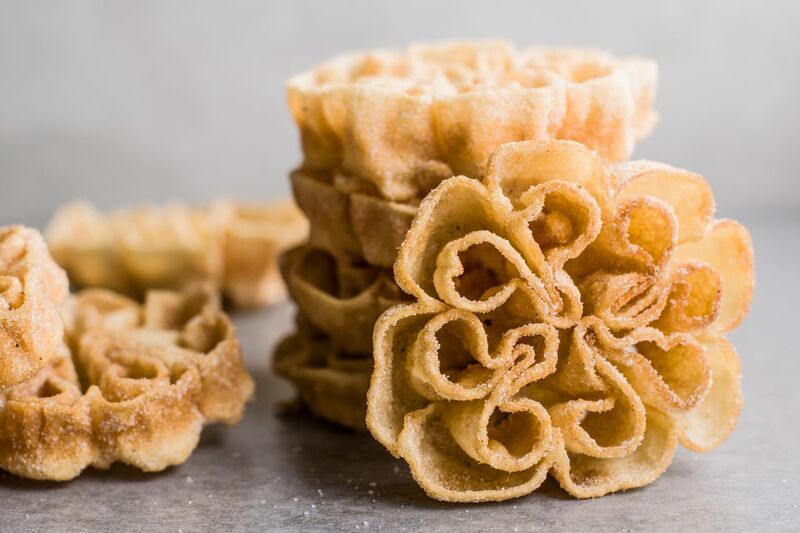 They are a lot like funnel cakes, but much thinner, less doughy, and more delicate. Called struva in Swedish, these are a popular Christmastime treat. Besides flower-shaped irons, you can also find stars and snowflake shapes. This recipe can be tricky, so it's important to follow the instructions exactly. Or, take a look at the step-by-step instructions. Be very careful with the rosette iron. It gets very hot while the cookie is frying in oil. Once it comes out of the oil, the cookie edges are either gently dipped in frosting or a sugary mixture or sprinkled with confectioner's sugar. The rosettes should be stored at room temperature in an airtight box. They will stay crisp and tender for about four days, but they most likely will not last that long since it is hard to eat only one. Several world cultures have a similarly made cookie. In Iran, these cookies are called nan panjerehei, which literally means brittle (window-like) bread. In Turkey, they are called demir tatlisi, which means iron dessert, a reference to the iron mold used to make the cookie. In Mexico and Colombia, these cookies are called bunuelos and solteritas, respectively. The Christian community in the southern Indian state of Kerala makes achappam during Christmas and special occasions. A similar form is available in Sri Lanka as well, which is called kokis. In a large bowl, beat the eggs slightly. Add the flour and milk alternately to the eggs, blending until smooth. Then, stir in vanilla. The batter should be about as thick as pancake batter. If it is not, add more flour, a tablespoon at a time. If it is too thick, add a teaspoon of milk at a time. The consistency of the batter is critical to the success of the recipe. Heat 3 inches of oil in a deep fryer to 365 F. Place a rosette iron in the hot oil for 60 seconds. There is no way to take the temperature of the iron; just know that it has to be hot. Dip the hot iron into the batter, making sure not to let the batter run over the top of the iron. If you do, the rosette will be impossible to remove. This takes some practice. It is best if you make a few rosettes a little more shallow than they should be just so you get the feel of the technique. Immerse the coated iron in the hot oil and fry for 25 to 30 seconds until light brown. Slip the rosettes off the hot iron using the tip of a knife, and place onto a paper towel. On a large plate, combine the sugar and cinnamon and mix well. Dip the rosettes in this mixture while they are still warm. You can also sprinkle the cookies with powdered sugar. Do not skip this step. The cookies are not really sweetened until they are coated in some kind of sugar.